SS5H7 Trace important developments in America from 1975 to 2001.
a. Describe the collapse of the Soviet Union, including the role of Ronald Reagan. b. Describe the events of September 11, 2001, and analyze their impact on American life. Why don't the U.S. and the Middle East get along? This is a very complicated question with many possible answers, so answering it in a few paragraphs is very difficult. Here is my best shot. The Middle East is mostly Muslim (which can be a very strict religion) and the United States is seen as showing a lack of respect to strict Muslim belief's because they allow people for worship God however they want or not at all. Many muslims find this unthinkable because they follow such strict rules in their attempt to please God. This by itself is not the only reason so many people dislike America, because there are many countries that allow people freedom to worship God however they choose. After WWII and the horrible Holocaust, the country of Israel was formed for Jews. The problem was that many people feel like the land was taken away from the Palestinians unfairly. The Palestinians were mostly Muslim. The U.S. was the first country to back up Israel and the U.S. has supported Israel ever since. Even though Israel is a tiny country, they are feared because of their strong alliance with the U.S. Many Muslim countries around Israel dislike the United States for supporting them. The U.S. has been very involved in Iraq. In 1983, they helped Saddam Hussein gain power of Iraq. The U.S. helped put him in charge, because they were against Iran. Then in 1990-91, when Hussein tried to invade Kuwait, the U.S. brought their military over to stop him. Finally in 2003, the U.S. feared Hussein was making nuclear weapons and they were also afraid that there might be future terrorists who would use the weapons in an attack. They invaded Iraq and Hussein was removed from power. Hussein had done horrible things including killing many of his own people, but many people in the Middle East didn't like that the U.S. was trying to control everything that was going on in the Middle East. After the September 11th terrorist attacks in 2001, the U.S. declared a War on Terrorism which has meant using drones to attack terrorist groups in many different countries in the Middle East. The U.S. hasn't declared war against these countries, but they have used drones to kill terrorist leaders who are headquartered in these countries. Many times a drone attack will kill the terrorists, but may also kill other people nearby. 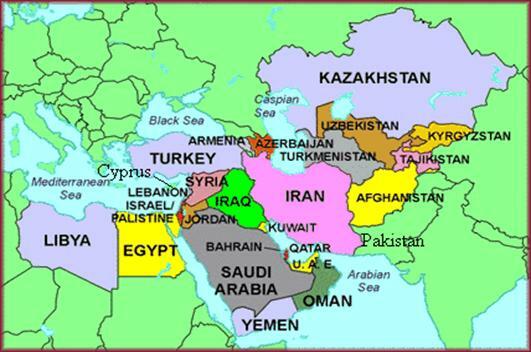 The reason the U.S. has been very involved in the Middle East is because of the large amounts of oil in the region. Many people in the Middle East, say that the only reason the U.S. is involved so much is because they are trying to gain control of their resources (oil products). 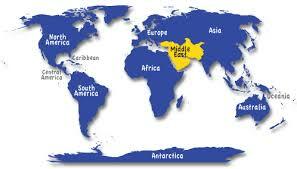 The Middle East is a part of the world seen in yellow on the map below. It is in the middle of Europe, Asia and Africa and has been the center of a lot of conflict (fighting) for centuries. It is a very difficult region because it is where three different major religions got started. Christianity, Islam and Judaism all started in the Middle East. IT IS IMPORTANT TO REMEMBER THAT THE ALTHOUGH MANY PEOPLE IN THE MIDDLE EAST DO NOT LIKE THE UNITED STATES, THERE ARE MANY PEOPLE THAT DO SUPPORT THE U.S. As in any situation, people should be judged by their own actions and not the actions of others. It is also important to remember that there are a lot of other much more detailed factors which are involved. Entire books could be written about the United States involvement in the Middle East.